If you suffered severe injuries or your loved one was killed in Alabama in a bicycle accident caused by another party’s negligence, you are probably overwhelmed by a number of concerns. You are very likely facing significant medical bills with the prospect of even more in the future, and these problems are compounded by you not being able to return to work for a seemingly interminable amount of time. It is important to understand that the negligent party in your accident could be liable for all of the damages you have suffered. Farris, Riley & Pitt, LLP represents bike crash victims in Birmingham and all surrounding areas of Jefferson County. We have been helping all kinds of injury victims throughout Alabama for more than two decades. Our firm is committed to helping people seriously injured in bicycle accidents get justice. You do not have to try and navigate the civil claims process alone. Call (205) 324-1212 to have the Birmingham bike accident attorneys at Farris, Riley & Pitt, LLP review your case and help you understand all of your legal options during a free consultation. Why Do I Need a Bicycle Accident Lawyer? Following a bicycle crash, you might think it’s relatively easy to file a related injury claim. Nothing could be further from the truth. In most cases, both the driver and their insurance company will very likely argue that your own negligence contributed to or directly caused the accident. The insurer may act sympathetic at first and express a desire to see that you are taken care of, but you should not be fooled. Most phone calls from insurance companies have the specific goal of getting victims to unknowingly make recorded statements that ultimately damage their personal injury claims. You want to retain legal counsel primarily to have an attorney handle these conversations with insurers on your behalf. Farris, Riley & Pitt, LLP will take care of these phone calls for you so you can focus on your recovery. Our firm will begin negotiating a settlement that provides for all of your needs, and we will not hesitate to file a lawsuit if the insurance company refuses to provide adequate compensation. The lawyers of Farris, Riley & Pitt, LLP have obtained numerous multimillion-dollar verdicts and settlements. We will fight to make sure you get every single dollar you are owed for your bicycle accident. Our firm will conduct an extremely thorough, independent investigation of your crash scene to determine the exact cause, collect important evidence, and identify every single liable party. Kirby Farris and Ken Riley are both lifelong Alabama residents who take pride in helping the people they consider to be friends and neighbors. 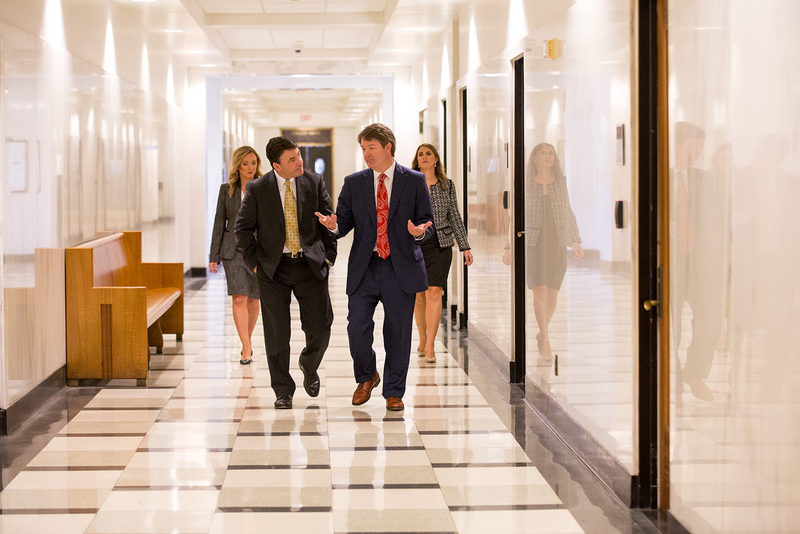 Mr. Farris and Mr. Riley are members of prominent legal organizations, such as the Alabama Bar Association, Birmingham Bar Association, and American Bar Association. They are both admitted to the Alabama Supreme Court as well as the United States District Court for the Southern District of Alabama, the United States District Court for the Northern District of Alabama, and the United States District Court for the Middle District of Alabama. Farris, Riley & Pitt, LLP also represent bicycles crash victims on a contingency fee basis, so you do not pay anything unless you receive a financial award. Let our attorneys evaluate how we can help you when you call (205) 324-1212 to receive a free consultation. Alabama Code § 32-1-1.1(81) establishes that every device by which any person or property can be transported upon a highway is considered a vehicle. Under this statute, a bicycle is considered a vehicle, which gives its operator the same rights and responsibilities as drivers of motor vehicles. Under Alabama Code § 32-5A-82, a vehicle overtaking and passing another vehicle, such as a bicycle, must maintain a safe distance. A safe distance is a distance of not less than three feet on a roadway with or without a marked bicycle lane if the roadway has a marked speed limit of 45 miles per hour or less and does not have a double yellow line. Alabama Code § 32-5A-52 also prohibits any person from driving any vehicle upon a sidewalk or sidewalk area. Distracted Driving — A motorist may have been text messaging, checking email, or talking on a cell phone while driving. They also might have been distracted by trying to adjust their stereo, navigating a GPS device, or simply eating. Drivers are subject to numerous distractions that can take their attention off the road. Mobile phones are typically the most common distractions, and such distractions may be able to be proven in court when phone records are obtained. Driving Under the Influence or DUI — Any motorist who operates in violation of state drunk and drugged driving laws is much more likely to cause a traffic crash. Victims in these cases may also be eligible for punitive damages in addition to underlying compensatory damages. Speeding — Drivers who violate posted speed limits do not have the necessary stopping distances when bikes cross their paths. Speeding drivers are also more subject to possible loss of control. Other Traffic Violations — Failure to obey traffic signals or traffic control devices is another common interaction that can result in bike accidents. In most cases, a driver being ticketed for another infraction can be used to demonstrate negligence. “Dooring” — A dooring accident occurs when a motor vehicle occupant swings open the door to an automobile right in front of an oncoming bicyclist. In these cases, bicyclists may be thrown several feet from their bikes. Not all accidents necessarily involve motor vehicles. Bicyclists who suffer injuries in crashes caused by mechanical issues with their bikes may have potential claims against parts manufacturers if defective parts are involved or against maintenance companies if a part was improperly repaired. No single factor in your case has quite the detrimental effect of contributory negligence. Simply put, contributory negligence refers to any kind of negligence on the part of the victim—even just 1 percent—that proximately contributes to their injury. Alabama is one of five U.S. states that allow defendants to use a contributory negligence affirmative defense, which when proven, bars victims from recovering anything. The lone exception provided to a contributory negligence defense occurs when a defendant has engaged in willful or wanton conduct. Insurance companies that contact bicycle accident victims are frequently fishing for statements that could be construed as contributory negligence, which is why you should avoid speaking to any insurer until you have legal representation. How long do I have to file a bicycle accident claim? Most injury actions are subject to a statute of limitations of two years. One important exception applies to minors, who have two years from the date of their 19th birthday to file a legal claim. Limitations periods can also be tolled (delayed) if a victim can prove that they sustained a disability at the time of injury and were declared incapacitated by a court. Can I sue a governmental entity for dangerous roadway conditions? You can, but you generally need to do so quickly. Alabama Code § 11-47-23 establishes that tort claims against a municipality have to be presented to the clerk within six months, and Alabama Code § 11-12-8 states that claims against counties have to be presented within 12 months. Damages are also limited (or “capped”) in these types of cases, as Alabama Code § 11-47-190 provides that no judgment or combination of judgments against a municipality and/or any officer or officers, employee or employees, or agents thereof can be more than $100,000 per injured person and no more than $300,000 per single occurrence. Alabama Code § 11-93-2 also limits damages recoverable against governmental entities to $100,000 for one person in a single occurrence and $300,000 in the aggregate when more than two persons have claims or judgments. The Alabama Department of Transportation (ALDOT) reported that the 290 bicyclists involved in traffic crashes in 2016 was the most of any year in the 10-year period dating to 2007. These accidents resulted in 214 injuries and 4 fatalities. According to the National Highway Traffic Safety Administration, in 2016, Alabama had the lowest percentage of pedal cyclist fatalities among total fatalities and lowest cyclist fatality rate per million population in the nation. NHTSA recorded Alabama as having two pedal cyclist fatalities that year. The Centers for Disease Control and Prevention found that more than 1,000 bicyclists were killed in the United States in 2015, and there were almost 467,000 bicycle-related injuries. Fatal and nonfatal injuries to bicyclists resulted in medical bills and productivity losses totaling $10 billion, according to 2010 data. According to the Governors Highway Safety Association, bicyclist deaths nationwide rose 12.2 percent in 2015, which was the largest percentage increase of any other roadway user group that year. The GHSA also reports that 2 percent of yearly fatalities resulting from motor vehicle crashes are bicyclists. Farris, Riley & Pitt, LLP has been assisting bicycle crash victims in communities throughout Alabama for more than 20 years. Our lawyers will work tirelessly to help you recover the compensation you need and deserve for all of your medical expenses, lost wages, and other damages. If you were seriously injured or your loved was killed in a bike accident in Jefferson County that was caused by another party’s negligence, contact Farris, Riley & Pitt, LLP as soon as possible. Call (205) 324-1212 or contact us to have our attorneys provide a complete evaluation of your case during a free consultation.